You have added Let’s All Get Strappy Eyelet A-Line Dress in White into shopping cart. This strappy-back dress is perfect for those happy summertime days! The Let’s All Get Strappy Eyelet A-Line Dress is a beautiful embroidery and eyelet details that we love. This dress is fully lined. It has a V neckline, adjustable spaghetti straps, an empire waist, and a flowy A-line skirt. Embroidery and eyelet cutouts decorate the bust as well as the bottom hem of the skirt. The most unique part of the dress is the open strappy back which creates a unique pattern. This dress is the perfect combination of flirty and girly and is completed with a hidden side zipper. This dress is perfect for any summer gathering or social event. We picture this dress paired with wedges or beaded sandals. A beaded headband and delicate earrings would complete a boho summer style. Details: Adjustable spaghetti straps. Fully lined. Hidden side zipper. 100% cotton. Lining: 100% polyester. Dry clean only. Small measurements: Top of bust to hemline: 29”. Bust: 32”. You have added Let’s All Get Strappy Eyelet A-Line Dress in White into Wishlist. You have added Let’s All Get Strappy Eyelet A-Line Dress in White for Stock Notification. 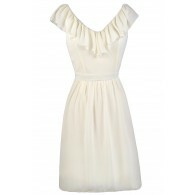 You have set Let’s All Get Strappy Eyelet A-Line Dress in White as a loved product. You have removed Let’s All Get Strappy Eyelet A-Line Dress in White as a loved product.